Recommended Citation: Guerra, M, M Joseph, E Ramirez, K S Koong, and L C Liu. Some Observations on the Occurrences of Data Breaches. In The Proceedings of the Conference on Information Systems Applied Research 2009, v 2 (Washington DC): §3563. ISSN: 0000-0000. 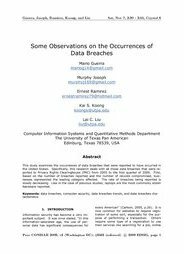 This study examines the occurrences of data breaches that were reported to have occurred in the United States. Specifically, this research deals with all those data breaches that were reported to Privacy Rights Clearinghouse (PRC) from 2005 to the first quarter of 2009. First, based on the number of breaches reported and the number of records compromised, businesses represented the leading category affected. The rate of breaches being reported is slowly decreasing. Like in the case of previous studies, laptops are the most commonly stolen hardware reported.